A beautiful 14kt yellow and white gold pendant or enhancer with 1 off round white with silvery overtones baroque pearl, approx. 12.8 x 9.25mm and 3 bead-set round brilliant cut diamonds, est. 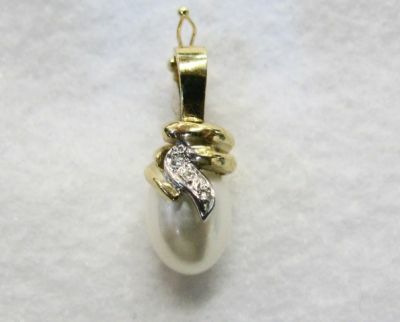 0.03ct (clarity: SI & colour: G-H)> The pearl has a medium luster and there are no apparent blemishes. It has a pinched "figure 8" safety clasp.